Kanimar is the tutelary Goddess of the lowland Irula tribal peoples of Kanchipuram District in Tamilnadu South India. She is the first among the Ezhu Kaniamman, or Seven Maiden Goddesses, whom the Irula worship, by fire-walking and entering into oracular trances. With the permission of the Irula women, who are the creators of this embroidery art displayed, we have named this site after her, in the hopes that Kanimar will bless our endeavor. 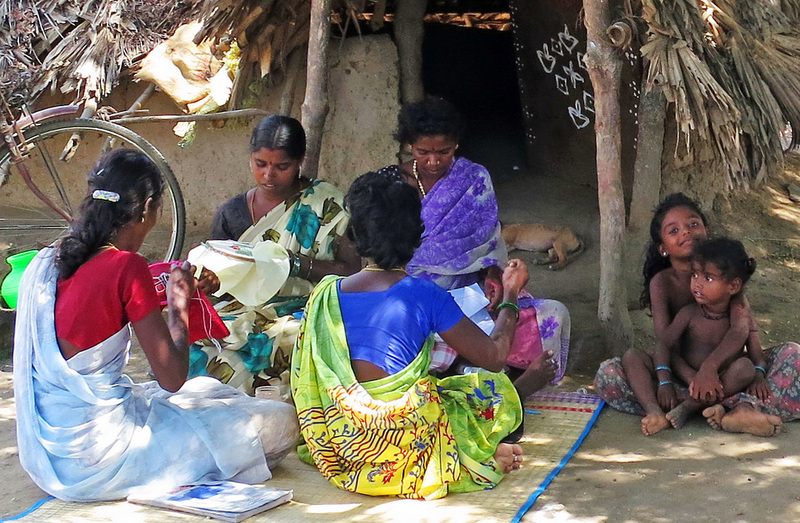 The Irula of Northern Tamilnadu are classed as a primitive Scheduled Tribe and are not a caste. They are additionally viewed as being marginal as they own little or no land, even under their own dwellings, often have no identity documents and have few possessions. Their origins are clouded by a lack of any history but they are physically and culturally distinct from the Tamils. In all likelihood they are descendants of the aboriginal forest dwelling hunter-gatherers who inhabited Peninsular South India prior to the coming of the agriculturalist Tamils about 2500 years ago. Their traditional occupation has been the catching of snakes, which with the outlawing of the sale of snake skin, they do now for purposes of venom extraction only. Otherwise they presently support themselves as unskilled daily wage laborers, wood cutters, agricultural workers, etc. and are often the victims of bonded labor schemes, a form of illegal modern day slavery. South Asian Village Empowerment Intl a US 501(c)(3) Non-Profit Corporation and its Indian partner, Tamilnadu Village Outreach, have since 2005 offered sewing classes to rural women in the Tiruporuur Block of Kanchipuram District. Through these classes we became acquainted with the Irula women. They had no surviving traditional handicrafts, but nevertheless showed themselves to be be capable of highly skilled and original hand embroidery work, which we present to you here.